The Mid December 2014 Issue of Practical Welding Letter, Bulletin 103, dealing with Updated Resources (NEW) on Hybrid Laser Arc Welding was not distributed by e-mail but it is available at Bulletin 103 and from the updated Welding Resources Page. Practical Welding Letter forwards to all Readers and their Families the best wishes for a Happy and Prosperous New Year 2015 in health and peace of mind. This issue 137, the first of the new year, opens with a note, based on a published article from the leading Welding Journal, that reminds the basics of shielding gases properties to best understand the factors influencing welding efficiency. The reported example of a study conducted might suggest how to monitor in practice real welding operations in order to collect elements conducive to optimized performance. Then, without endorsing specific commercial software solutions, we point out another published article where certain programs are outlined, that provide helping tools useful for assisting the welder in his/her daily job, and for collecting and organizing real time data from current operations, to help management in examining actual performance records, with the purpose of reducing variability and improving quality. Follows the example of the analysis of a specific brazing problem where the worry of possible corrosion development hinting to a change of flux, led to the replacement of the filler metal altogether and to the complete elimination of any flux. Ever heard of a SAW technological innovation, including the improvement of an established twin wire torch with the addition of a third, insulated cold wire? This development increases deposition rate and efficiency, while reducing heat input and improving impact test results. It would seem that the promised advantages could promote expanding its implementation wherever advisable. The field of carbon fiber reinforced plastic composites may seem too far from the normal worries of welding professionals. Besides the fact that any progress in that manufacturing technology might limit the expansion of metal fabrications, it would appear useful to keep an eye on those advancements in order to pursue metallic applications where advisable, and to understand which technical hurdles limit at this time the further progress of alternative solutions. The report of a study on NDT monitoring of impact damages on plastic reinforced structures might provide some understanding of the problems affecting their future applications. It is hoped that all readers might collect some useful information from this publication. You can always use the Search function from almost every Welding Advisers page. You can also browse the Site Map or the Index Page to find references to the subjects you may look for. The subjects treated in the Mid Month Bulletins, providing links to Online Sources, are listed in the current revision of the Welding Resources page. 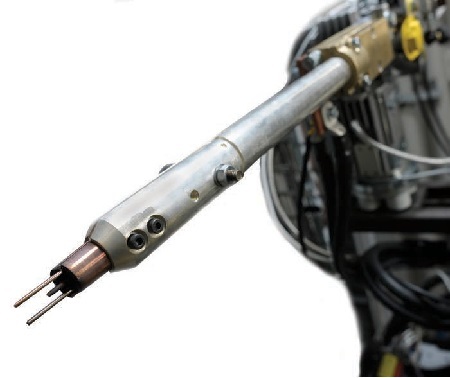 If you think you know all you need to manage efficiently your current Gas Metal Arc Welding (GMAW) operations, well, you may be in for some surprises, when you read a recent article published on page 41 of the December 2014 issue of the Welding Journal. There may be room for substantial productivity improvement if you take into account the governing factors that influence the resulting outcome. The said article lists a long series of benefits, that sum up in improved quality and reduced costs, gained by thoughtfully selecting the recommended blending of argon-based, two components shielding gases. 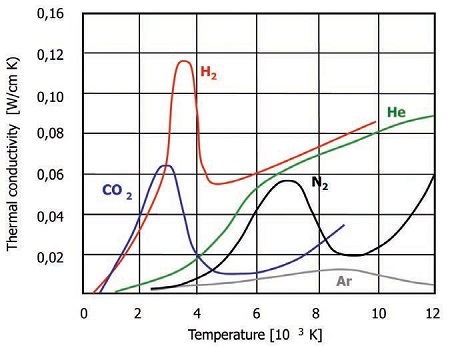 Among the different factors to consider are the ionization and dissociation energies of the gases, their thermal conductivity and the radial profile of the plasma arc, characterizing the energy transfer. The study reported checked two sets of welders employed each in welding a specific industrial product in one of two similar versions. All the data where automatically collected and then analyzed offline. If turned out that the largest expense was the consumable filler metal, at almost 70% of the total production cost. Also the shielding gas consumption was higher than the recommended, but leaks were suspected independent of welders discipline. The study detected unaccounted for parameter variability bringing to the conclusion that additional work is needed to reduce variation. Control in wire waste should be implemented. The authors conclude that understanding and establishing the actual weld costs involved and the factors that determine them are essential steps in the process of optimizing performance. This recommendation should be followed by all those responsible for the correct conduction of GMAW processes, with a view on improving productivity and assuring quality. Interested readers are urged to seek the above original article. Thermal conductivity of different shielding gas components. It has been observed that certain welding production shops are perceived by management as too difficult to manage using the normal industry tools. Especially if one refuses to dedicate to the task the necessary resources. By being viewed as a craft, to be governed only by insiders, the sole source of knowledge, whole welding operations shun the normal checks and balances that any normal management would implement, and become the highest contributing factor to quality. An article, titled as this note, published at page 48 in the December issue of the Welding Journal, points out that new tools are now available for helping Management regain its say in production and quality monitoring. The tools described are those developed by a specific supplier. There in no reason to suppose that only these are available. Interested readers would probably gain knowledge and benefits by researching the solution best adapted to their own specific conditions. Two types of software aids are described. postweld verification tools, meant to provide objective evaluations of the work done to all concerned. The article outlines the benefits to be obtained by implementing both of the two complementary tools. Avoiding mistakes and improving quality was never before achieved so easily by any management. Readers are invited to explore the tools introduced by the Author, without that this publication takes parts, endorsing or recommending them. the Search page for "Weld Sequencer™"
Readers wishing to comment on these ideas are welcome to share their views. 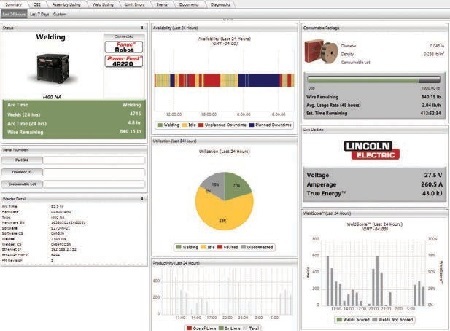 CheckPoint™, a Lincoln Electric production monitoring software package, offers dashboard views of arc time, consumable usage, weld parameters for each weld, and other data. In the brazing Q&A section in the December issue of the Welding Journal at page 26, a reader inquires on a proper copper based brazing filler metal, to join a braided copper cable to a copper post/rivet. The problem arises because the flux used with the 95%Cd - 5%Ag is difficult if not impossible to clean, leaving a corrosive residue. The internal proposal to search a solder instead, was abandoned because of high temperature service conditions ruling out soldering. Due to the dangers in working with Cadmium, specifically avoided in the European Restriction of Hazardous Substances Directive (RoHS), the brazing expert, Tim Hirthe, suggests to look for a different filler metal. The inquirer's suggestion to investigate the applicability of aluminum fluxes is eventually ruled out because residual aluminum in the flux might cause galvanic cell corrosion (instead of chloride corrosion), not a favorable alternative. The final suggestion (after having ruled out Zn-Sn [zinc-tin] which might include Cd) is to go to low temperature Copper Phosphorus alloy (AWS BCuP), which, although melting at higher temperature, needs no flux for copper to copper brazing. I am always fascinated by the thoroughness of the analysis of these practical recommendations and I think that much more than a simple answer can be learned in the process. Readers are addressed to the original WJ article for finding there the complete discussion of the alternatives. Laser Beam Air Cutting (LBC-A) is a laser beam cutting process variation where the laser beam melts the workpiece and an air jet removes molten or vaporized material. MIG Welding is a nonstandard term for Flux Cored Arc Welding or Gas Metal Arc Welding. Oxynatural gas cutting (OFC-N) is an oxyfuel gas cutting process where natural gas is the fuel. Pulsed Gas Metal Arc Welding (GMAW-P) is a gas metal arc welding where current is pulsed. Resistance Welding Weld Time is the duration of current flow through the workpieces in making a weld by single impulse. Stick Electrode is a nonstandard term for covered electrode. Thermal Spray Deposit is the coating or layer of surfacing material applied by a thermal spraying process. Weld Metal Crack is that occurring in the weld metal zone. This publication introduced, along the years, several updates on productivity improvements in Submerged Arc Welding. The last one, on SAW Optimization, appeared in PWL#134 in the October 2014 issue. A new fully developed SAW Technology is now introduced in an article published on page 46 in the December 2014 Issue of the Welding Journal. With the possible exception of those fortunate visitors of major Welding Conferences and Exhibitions, and of the dedicated habitual readers of WJ, there is possibly a large public not yet reached by this information. This cold electrode technology uses a special twin torch which, besides accommodating two filler wires in the same contact device, connected to the same power source and polarity, integrates a third, electrically insulated cold wire, between and parallel with the two hot wires, in the same device. The third wire speed is controlled independently from the other two. Its function is to absorb excess thermal energy and to increase the amount of deposited material without requiring additional heat. This permits to perform heavy welds with heat input below 76 kJ/in as demanded by ISO 15614 to satisfy impact toughness requirements for offshore applications. A specific industry using four such units is described. The major parameter used to evaluate productivity gain is weld deposition rate at the reported linear welding speeds. Remarkable increases are indicated, relative to regular twin SAW applications. While not intending to endorse or recommend the specific innovation described, we feel that interested readers may wish to explore for themselves if the advantages proposed might provide any benefits to their operations. From that same page a commercial brochure can be downloaded. Welding head with two parallel hot wires and an electrically isolated middle cold wire. The new Pages of this Month cover thoroughly, possibly in a more useful way, subjects and operations that were already introduced in the past. Maintenance and Repair are important subjects that need to be confronted with open mind, without being unduly disturbed by the urgent need to put equipment back to work in the shortest time. In the new page a check list is introduced which may be helpful in trying not to forget essential considerations. A reference is provided to a logical decision model program, available from a renowned Handbook, that can be followed to build a repair plan. It is hoped that this new page might come in handy when in need of some assistance for dealing with emergencies. Read it by clicking on Maintenance-Welding-Tips. The other page, the Mid December 2014 - PWL#136B - Bulletin_103 with links to Updated Resources on Hybrid Laser Arc Welding, is available by clicking on Bulletin 103. We hope it might be useful to those using the Hybrid Laser Arc Welding Technology. If you need specific reference difficult to find out, please let us know and we will do our best to come up with useful answers. ...how aluminum replaces steel in autos? ...how to solve Talent Shortage? ...ten things about hex Chrome and OSHA compliance? Sorry: the link to Farr was disconnected. ...how to join Two New Manufacturing Innovation Hub Competitions? ...how to pick up gold out of trash? 9.1 - Alloy Steel is an iron base metal containing specified quantities of alloying elements (other than carbon and the commonly accepted amounts of manganese, copper, silicon, sulfur, and phosphorus) within the limits recognized for constructional alloy steels, added to effect changes in mechanical or physical properties, generally following well defined heat treatment cycles. 9.2 - Bearing Test is a method of determining the response to stress (load) of sheet products that are subjected to riveting, bolting, or a similar fastening procedure. The purpose of the test is to determine the bearing strength of the material and to measure the bearing stress versus the deformation of the hole created by a pin or rod of circular cross section that pierces the sheet perpendicular to the surface. 9.3 - Compaction is forcing particulate or granular material together (consolidation) under pressure or impact to yield a relatively dense mass or formed object. In powder metallurgy, the preparation of a compact or object produced by the compression of a powder, generally while confined in a die, with or without the inclusion of lubricants, binders, and so forth. With or without the concurrent applications of heat. 9.4 - Degradation is a deleterious change in the chemical structure, physical properties, or appearance of a material. May be due to an uncontrolled treatment or to changing service conditions. 9.5 - Extractive Metallurgy is the branch of process metallurgy dealing with the winning of metals from their ores. 9.6 - Fold is a defect in metal, usually on or near the surface, caused by continued fabrication of overlapping surfaces. A forging defect caused by folding metal back onto its own surface during its flow in the die cavity. Could Extinct Clouded Leopards Be Reintroduced in Taiwan? The ability of predicting the residual useful life of structural fabrications is essential to guarantee economic continuing operation of critical life-affecting constructions. Although the specific methodology used to plan and investigate the monitoring of useful life left in a composite construction, may be remote from the pressing needs of welding professionals, it seems important to be open to accept new concepts which might help one in unexpected ways. While the knowledge and practice of periodical monitoring of the integrity of metallic manufactured structures are standing on solid (Fracture Mechanics) bases, the same cannot be affirmed regarding increasing numbers of composite materials objects. Therefore studies were initiated by the Welding Institute (TWI), managing with partners a joint industry project to try to correlate the results of nondestructive tests with numerical simulations of compression-after-impact (CAI) failure in uni-directional, carbon fiber-reinforced plastic (CFRP) composites, previously impact damaged specimens. The paper reported hereafter explains in its introduction that there is currently no accepted method of incorporating non-destructive test data, gained from inspection of impact damaged composite directly into finite element models capable of predicting mechanical performance. It then describes the composite tested and provides its original mechanical properties. Impact loading damage was then inflicted on selected specimens with different energy blows, within a testing machine designed to provide measurable and repeatable impacts. The resulting impact damage was assessed using ultrasonic testing (UT) for all panels and computed tomography (CT) was undertaken on four panels containing damage from each impact energy for validation purposes. The paper explains how the UT results were interpreted and analyzed, and how the delamination patterns were detected and recorded. A finite element model was prepared for evaluating the residual life of each one of the specimens with internal damage. A delamination prediction was elaborated for each interface, and incorporated into the simulation. The simulation was used to predict the failure mode within the load parameter selected for stressing the specimens. The specimens, mounted in a special fixture, were tested to failure in the proper conditions. For each test, strain stress and load were recorded in real time. Within the initial assumptions of the project, the study succeeded in predicting the CAI (residual) strength and in indicating that the buckling modes inducing final collapse are well predicted. Interested readers are urged to seek the original paper at the link indicated hereafter. Thanks so much, I hope to hear back from you. I got a message of a Reader with specific experience in a certain welding sector, proposing to write for this publication an article on current technologies and future developments. I was delighted by such an offer and accepted it immediately. I would like to get the same offer by many other readers with experience, willing to share it for the benefit of all this readership. Unfortunately, for the time being, he left after reading my comment that I would have preferred enriched content with more informative paragraphs. I did not want to dishearten him, I just pointed out that together we could come up with a more instructive note. I hope he will try again, and I invite all Readers to contribute their special interesting input. Jan. 10–13. Dubai World Trade Center, Dubai, UAE. March 31–April 3, China Expo Complex (Shanghai Hongqiao).